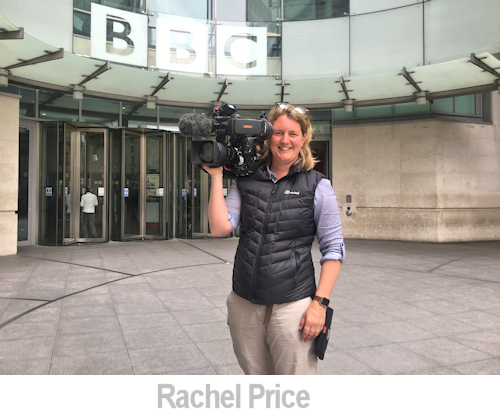 The start of Rachel's career as a BBC camerawoman began with an interest in music which progressed in to working with sound during her early career. After a move to the BBC and being introduced to cameras, she was hooked and so started a new career path as a news camerawoman. In our interview Rachel tells us about her early work, what she does in her role and the importance of learning the job as an apprentice. How did you get in to filmmaking? I started through a sound route into my career by being a keen musician in my teenage years. First I worked in recording studios, then theatre, then I became a Boom operator in TV/Drama and film in the North West. I worked for Mersey TV and Yorkshire Television before starting at the BBC in 2003. I came into BBC News through a mutli-skilled operating route concentrating on sound for North West Tonight. Once I touched a camera that was it, I was hooked. I trained up as a News Camerawoman and Editing. Did photography or filmmaking come first? Do you have a formal visual media education? No. I came through a music technology background and learned the rest on the job and through formal BBC camera and lighting training. My first paid job was a sound technician at Splash Studios in Wigan. How did your career progress between that and working at the BBC? Mainly through sound I explored other avenues through the �media� world until a job felt comfortable. Working on live music events, to sound for opera, to then asking to help a friend do a weekend sound-assisting on Hollyoaks, I was to explore what the industry had to offer. The way this worked was I went on sound association websites and emailed people for advice and created contacts and networked over email. This is where my luck came. I accidently emailed a BBC sound supervisor who invited me to come to Manchester BBC for a cup of tea. A trainee had not turned up that morning and I was cheeky enough to ask if I could take their place on a 1 month work placement for multi-skilled operating. This is how my career started at the BBC. But it wasn�t just luck, it was making opportunities happen so luck could happen. How did you get your start at the BBC? Once I got onto the trainee scheme of a month unpaid I used that month and dived into every opportunity that could happen. I even carried on working for a couple of weeks after that unpaid until they added me onto their casual contract. What are your responsibilities as a camerawoman? It�s hard to say what a typical day in news as there aren�t any. One day you could be filming the Royals on a pool rota (where you are filming for every news outlet) or the next you could be on a plane heading towards a breaking news story to a conflict zone or natural disaster. Even when working in more of a domestic environment in the UK each job is different. For example last week I worked on a long-format film (more than 5 minutes) for a mental health story, which involved well lit interviews using 2 cameras. Next day I filmed Kate Middleton for a royal rota filming for all outlets, then rushed and filmed a two-camera sit down interview with Bill Gates then ended the week filming the London Marathon. Bag of bits of cables for connectivity for going live if needed for my laptop. What kind of filming are you doing? I predominantly film for BBC Newsgathering but this involves any different outlets and styles. I have to be aware when filming that each outlet�s needs need to be met. For example for Radio 4 I need to make sure the audio is as �clean� as it can be. For the ten o�clock piece the framing and style will be different for digital and online pieces. Some times I will shoot the same thing twice to help different programmes. News is not always happy and for me the lows are the human side of working in news. But the highs for me are when you get to tell a story that makes a difference. For me that was filming the Ebola Crisis. Our output was making a difference to people understanding the difficulties out there. I was very proud the team won awards for our output. 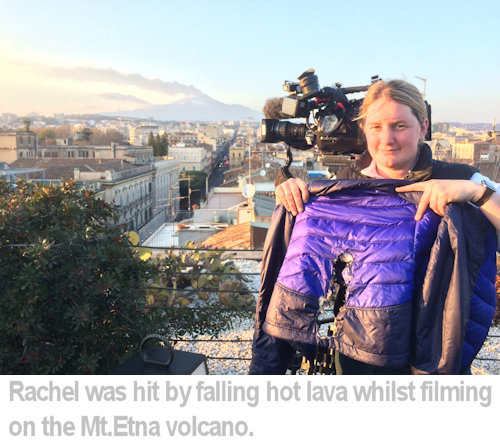 You were recently in a tricky situation filming on Mt Etna. Can you tell me what happened? Ironically I am trying to avoid hostile environments when travelling abroad so when we were filming a well organised trip Mount Etna, in Italy I was surprised our team got caught up in an volcanic explosion. We were filming a piece about volcanoes were monitored and new satellite technology was being introduced so scientists could monitor remotely. On the second day filming we had reached the summit where new lava had formed from the previous day we were up there. Whilst filming the lava, steam started to emerge. The snow by the lava caused a reaction with the lava, which is quite rare and then caused an explosion. Once I saw the steam I had gone into record and then as a team we started to pull away as the situation was changing. Then the explosion came quickly. I filmed as much as was safe to then ran with the rest of the team. Lava rocks were falling out the sky. I unfortunately fell over a few times and a lava rock went into the back of my jacket where it got caught between my bag and my back. Thankfully I have had experiences in hostile environments and I reverted back to my training. We kept close as a team and got ourselves off the mountain safely. The tour guides that worked up the mountain did an amazing job and got everyone off Mount Etna safely. People were burnt and bruised but thankfully nothing too serious. It was a very close escape. What would come next in your career? I ask this question all the time. I don�t know. Currently I am very happy to be filming worldwide seeing opportunities that the ordinary person doesn�t get to see. The day I don�t enjoy it anymore is the day I will look at doing something else. But I can�t see that happening. When do you get to say you filmed a rocket launch! Do you create films in your own time? I don�t get a lot of down-time but if I do I like to film music videos as it is very different from my job and I am a musician myself. "The day I stop learning is the day I�m not doing my job properly" You have an apprentice with you for a year. Tell us about that. The BBC have committed to bringing on apprentices and I have the privilege of having one for a year. As I didn�t have any formal training I can relate to getting the training whilst doing the job. Apprenticeships help to do this. Half way through the apprenticeship my apprentice now films stories under my supervision. We have training days but mainly we learn on the job. He films, edits and learns all the skills you need for being a Camera Journalist. Every assignment we do is so different they learn another skill every day. How important is a formal education for someone looking to become a broadcast camera operator? Personally I�m not sure someone necessarily needs a huge amount of formal education but experience is more important. But to get the experience you need some sort of education. If I had it my way everyone would start as an apprentice! As well as an education, what qualities does a cameraperson need to be successful? People skills! You need to be able to walk and talk your way through situations. The ability to listen and learn, even when you have done it a long time. Everyday is different. The day I stop learning is the day I�m not doing my job properly. Email, get in contact, use social media to speak to as many people in the industry so help for the luck to happen for a job to happen. Put yourself in situations where you can gain experience. All images � Rachel Price or their respective owners and used with permission. All of our career interviews with filmmakers, photographers, broadcast TV and related visual-media professionals.